When I decided to find myself a pair of stylish, long-lasting boots the first brand that came to mind was, of course, Dr. Martens. This brand is ingrained in my mind as the maker of an iconic shoe, beloved by sub-cultures, but also by lovers of durable and extremely comfortable boots. I’ve had other pairs of boots that have had a more of a neutral appearance than the Dr. Martens 1460 boot, but there’s a certain desirable flair to these boots. The sole is perfect, and the eye-catching yellow stitching makes a statement that no other boot can replicate. 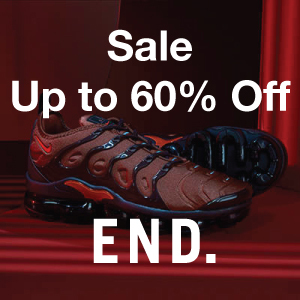 These boots are comfortable enough to take the place of your preferred sneakers. If you stick to slimmer fitting pants you’ll be able to style almost anything with the Dr. Martens 1460. When ordering my pair of Dr. Martens 1460, I went with my standard size choice. I found that the boots fit me perfectly, but spacious enough to not cause pain and blisters when breaking-in the shoes. While these boots are water resistant, they are not completely waterproof. Walking during rainy weather was fine but make sure you care for the leather properly after they get wet to keep the leather in good condition. Using a shoe balm with beeswax is recommended for the best results. Once these boots are broken in, without a doubt, they will be one of the most comfortable shoes you’ll own. 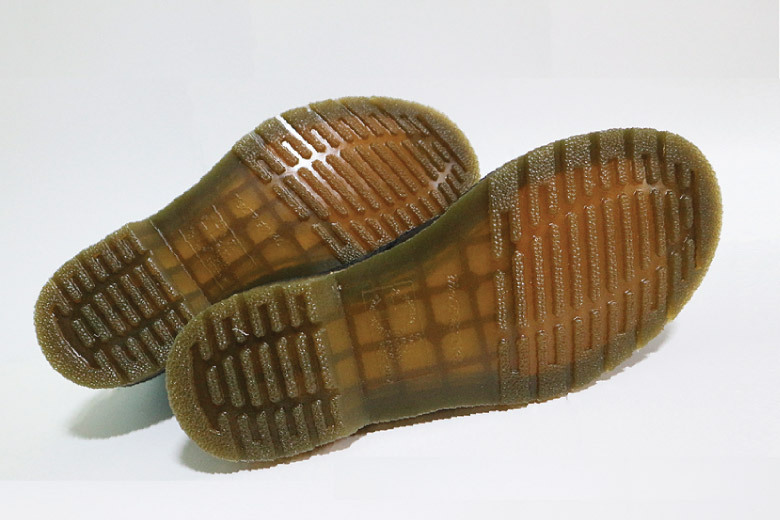 The sole has no shank, which allows for a lot of flexibility to fit your foot as you walk. Most boots do have a shank in the base, so the sole will be more rigid and less comfortable. One of the most notable aspects of the Dr. Martens 1460 is the appearance of the leather. The leather is sourced from both South America and Asia and is corrected full grain leather. The supple finish of the shoe can come across to some as looking too perfected and almost as faux leather for some people, but for me, the shine is part of the Dr. Martens appeal and adds a nice flair to the boots. 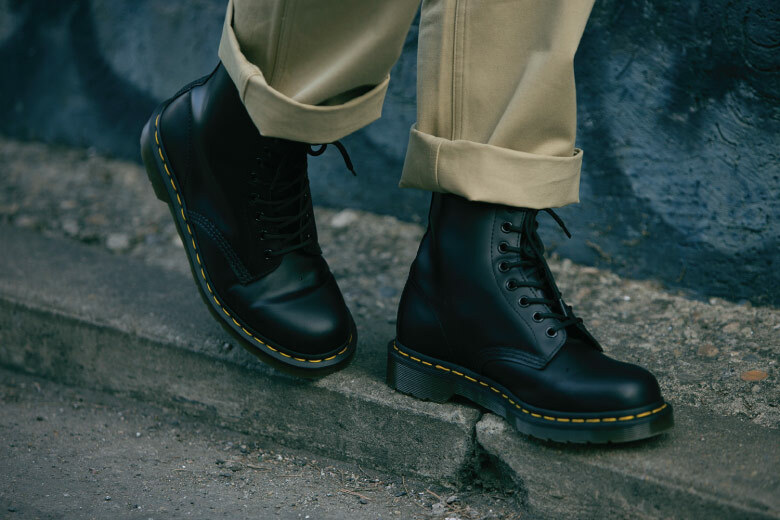 Many long-term buyers of Dr. Martens complain that the change in manufacturing to be predominantly in Asia has produced a reduction in quality, mostly referring to the leather. 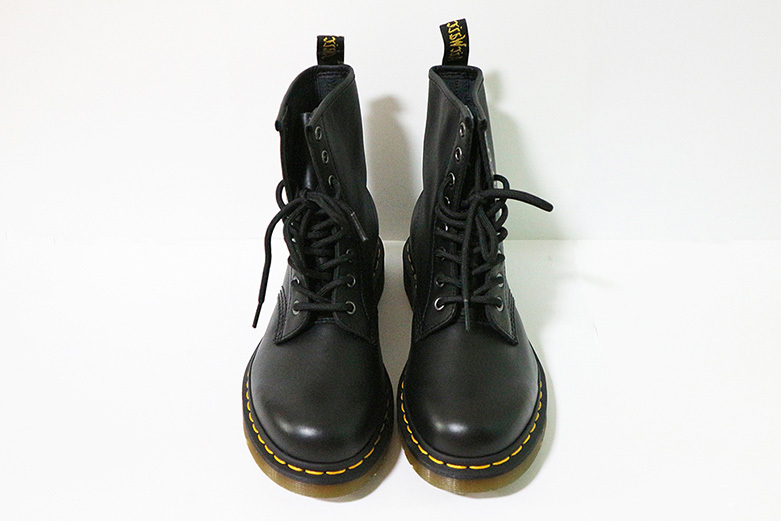 However, you can still purchase Dr. Martens 1460 that are made in England, just be prepared to pay a much higher amount. Considering the affordability of these boots, I was very pleased with the quality of the leather and the overall construction. The Asian-made 1460’s leather is quite durable, as well as aesthetically pleasing. Dr. Martens also makes a special balm, Wonder Balsam, which is made of beeswax, coconut oil, and lanolin. Investing in this balm or a similar balm will help protect the leather from water and will maintain the suppleness of the leather, helping stop any possible cracking. Getting into the finer details of the boot, one of the main factors of longer-lasting boots the sole. 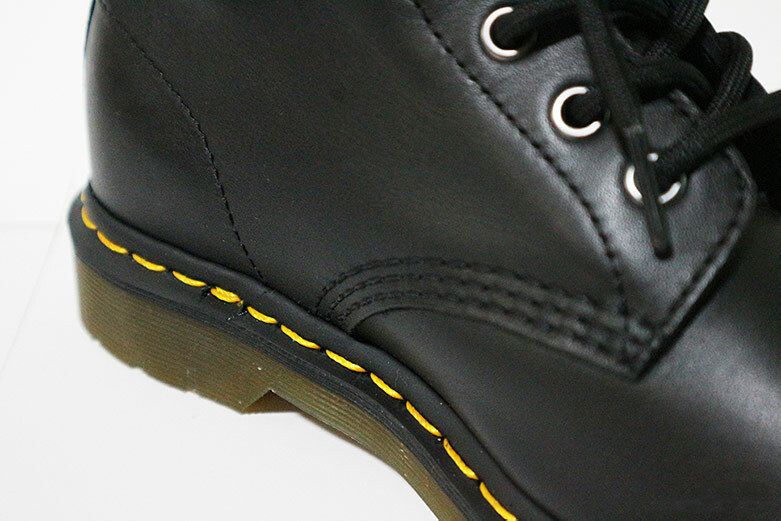 The Dr. Martens 1460 boot has a Goodyear Welt, but the process is done in a unique way with heat-sealing, so you will need to find a cobbler who specializes in this method re-soling. The yellow stitching around the base of the boot is extremely secure because of the heat-sealing Goodyear Welt, and the rest of the stitching visible on the boot is also durable and neat. Most of the stitching is single-stitch except for two parts on each side of the boots. Now, for my favorite part of the Dr. Martens 1460 boots, the sole. Constructed with Dr. Martens trademark ‘Air Wair’ sole, these boots are incredibly comfortable and feel very supportive for your feet. The ‘Air Wair’ sole is oil and fat resistant and is very shock-absorbent, so long as you’re caring for these boots properly, you will be able to wear them in almost any environment. They do take a bit of wearing to get the fit right, but once they are broken-in, these Dr. Martens are sure to be a go-to shoe because the sole is nice and bouncy, perfect for daily activity. 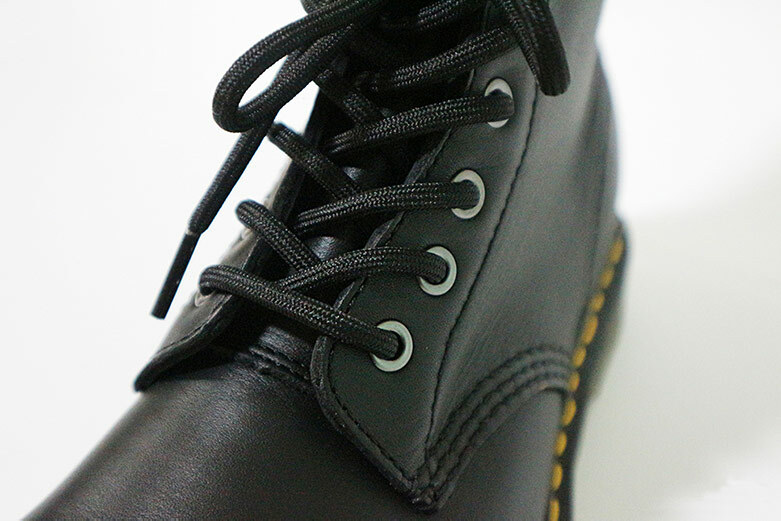 A similar boot to the Dr. Martens 1460 is the Solovair 8-Eyelet Derby Boot. It’s a sturdy boot with a similar style, but due to all manufacturing being in England, you can only acquire these boots for a higher price. Solovair does claim to have a sole with “suspension technology” so their boots are comfortable, but the leather is known to crack and split, making it more susceptible to water damage. 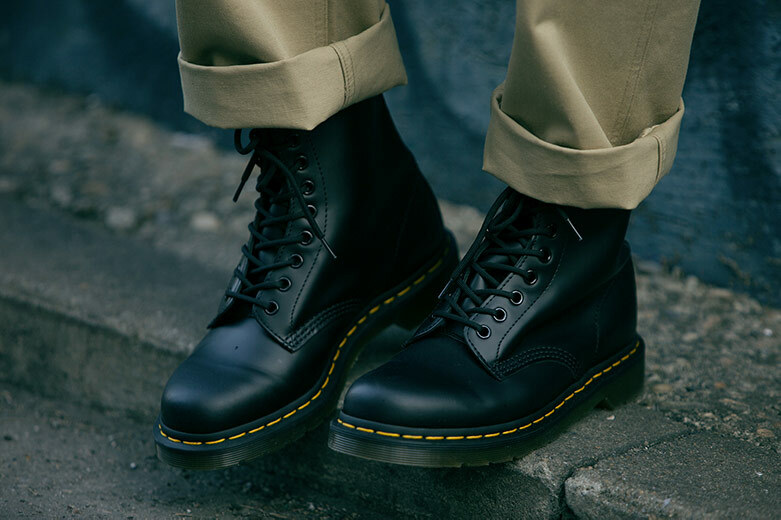 The overall quality and feel of the Dr. Martens 1460 is certainly worth the price, and I’d argue that they come out ahead of other boots that are similar, even if competing boots are made in the United Kingdom. I was surprised by how well my feet were supported by the sole and how soft the leather was. I do have to take care of the leather with the Wonder Balsam, but no more often than I polish my other leather shoes and boots. The mainstream understanding of how these boots are in a grungy way, along the lines of punk and rock attire. However, these boots can be styled in so many ways. They are generally worn with slim-fit pants, but they can be styled with looser pants if done in the right way, with a bit of an edgier look. Styling with slim-fitting pants can make for a classy outfit with the added uniqueness that the Dr. Marten 1460’s has. After having the experience I’ve had with the Dr. Martens 1460 boots, I believe every man would benefit from having a pair in their wardrobe. These boots have a timeless silhouette that can be worked into many different outfits. The 1460’s encouraged me to get more creative with my outfits, for both day and night wear. I’m so glad they have this versatility because I found myself wanting to wear them quite often, they are just so incredibly comfortable. These boots will always be a go-to shoe for me from now on.